Expertise is the key for The Planning Centre in a wild Windsor market. Ask Marc Rivest and David Johnson how they decided to celebrate more than three decades in business together, and you’ll get a rather candid answer: “With a case of beer,” Marc jokes. Co-owned by Marc and David, The Planning Centre is a Canadian mainstay in the industry. 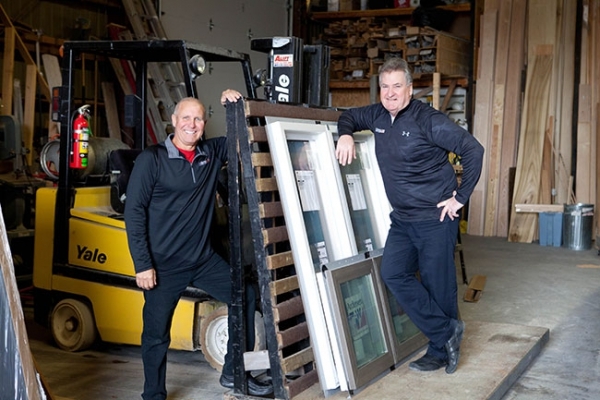 Located in Maidstone, Ont., the company has been helping customers in Windsor and surrounding areas “make the right decisions on windows and doors” since 1985. In 2017, The Planning Centre enters its 32nd year. The distribution went from Andersen to a wholesale division just outside of Detroit, which then went to a dealer and then to retail or consumer-direct. Being located close to the Canada-U.S. border, “we could go across every day and pick up products from our wholesaler,” says David. If there’s one big change The Planning Centre has seen between 1985 and now, it’s the end user. “Thirty years ago, we did a lot of retail direct,” says Marc. “Regulations were pretty lax back then, so people were building homes themselves and acting as the home builder and contractor.” Today, The Planning Centre still does a fair amount of retail, but “with more restrictions in the building industry, we now work mainly with contractors,” says David. Still, consumers are continuing to play a role in the decision-making process by taking on much of the window and door shopping themselves. Marc and David attribute this evolution to two things. First, with the rising cost of utilities and continuously changing building codes, consumers are increasingly conscious of making their homes as energy-efficient and “air-tight” as possible through careful selection of products like windows and doors. Second, consumers are feeling inspired by the expansive range of designs featured in magazines, on Pinterest and Houzz. “The impact of all that is fuelling the consumers’ need and want for customized windows in a whole range of shapes,” says David. As custom windows and doors are The Planning Centre’s specialties, “we’re now making windows for customers that are bigger and taller than ever before – like bi-folding, retractable walls up to 40 feet long and 10 feet high,” David adds. Consequently, driven by homeowners and consumers, the installation market now makes up a large portion of The Planning Centre’s business today. “I’d say it’s expanded 10-fold since the mid-1980s,” Marc estimates. Finally, being Canadian may also play a role in The Planning Centre’s longevity. Most of the company’s customers are in southwestern Ontario, not far from home. “We like to work in our own backyard; we don’t want to step on our fellow Andersen dealers’ toes and try to stay out of each other’s way when it comes to getting business,” says Marc. The Planning Centre continues to evolve, thanks to another generation. “My son is coming into the business, as all of our kids have,” says David. “He’s going to help us expand the business from a more ‘millennial’ angle, and incorporate some newer ideas with his background.” Meanwhile, David and Marc will continue carrying on the same business structure and keeping their regular day-to-day routine, all while taking things to a newer level.